Papua New Guinea Education Department launched the Citizenship and Christian Values Education Curriculum (CCVE) aiming to develop minds of students that education can be enriched using Christian principles. 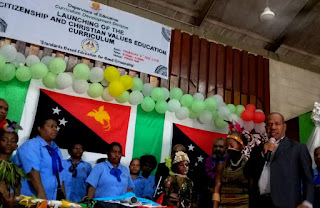 Education Minister Nick Kuman said CCVE requires the students to be equipped with essential knowledge, skills, values and attitudes. The Minister stated that knowledge is power and instilling Gods principle to children at their early age does make a difference in the future of the individual as well as the nation. There are two objectives the Education department wants to achieve after the implementation of the curriculum. ‘’Firstly we want to see that the spiritual development of our young people in this country must be strengthened at all levels from elementary to high school’’, said Mr Kuman. ‘’ Secondly is to make sure that all programs should encompass development of the spiritual values and attitudes off our young people in this country’’. The Curriculum will be implemented in 2019 in all primary and elementary school across the nation.